Victory is mine. For the first time in maybe a decade, I have managed to get some of my homemade applesauce jarred and into a canner before my family can eat it all up. I peeled apples all day for those 7 little jars of sauce, you know. 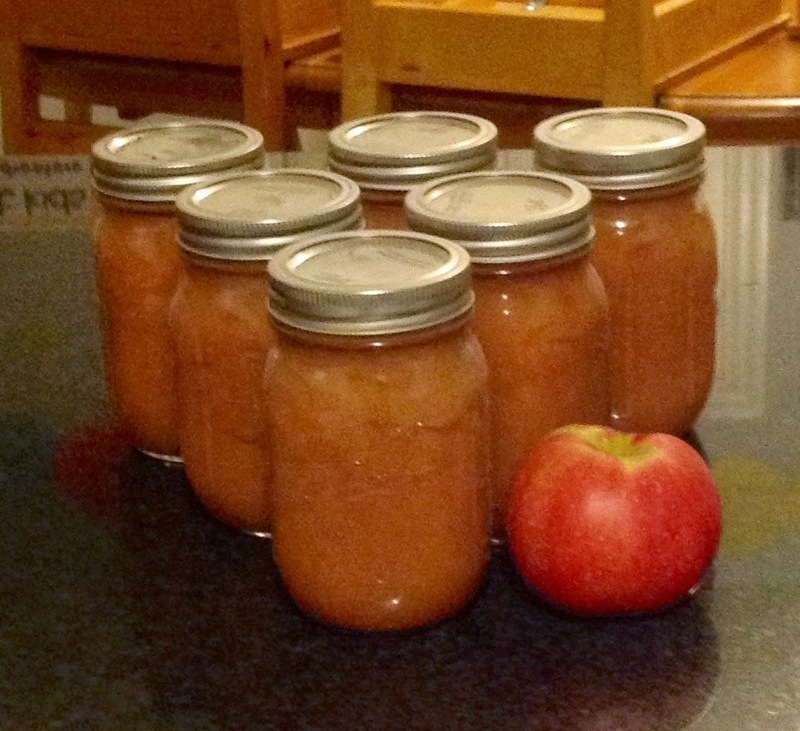 I read online that 21 pounds of apples should result in 7 QUARTS of applesauce - I used at least that amount and ended up with only those 7 pint jars plus another 3/4 of a quart that my family got their hands on. Meaning, my yield is only a little more than half of what it should be. I don't know what I am doing wrong here. I am currently reading a memoir called A Fort of Nine Towers: An Afghan Family Story. It's written by someone who grew up in Afghanistan during the late 1980's and 90's. Let me tell you, it has made me even less sympathetic toward any complaints emanating from my offspring. Brian had the temerity to make a face when I told him to take out the garbage tonight. "Listen," I said, "it's not as though you have to dodge sniper bullets in order to reach the trash can." I don't know why that kid always looks so confused when I talk to him. That applesauce looks BYOOOTIFUL. I am just a wee bit jealous. Congrats on getting the applesauce canned! Don't peel or core the apples. After they've cooked, put them through a grinder/strainer and you'll have a much greater yield. Plus, no peeling. I never ever get what the recipe calls for when I can. I'm like you - if it calls for a certain amount of quarts then I will always get that amount in pints - even though I always use more ingredients than they call for. It never fails! So annoying - especially when you work all day for a few measly pints. But, it's better than dodging bullets in Afghanistan I suppose! Menopause fairy...insomnia dust... you are singing my song! Canning..oh dear God, you have me contemplating whether or not I should learn how to make and can applesauce because it looks so good! I never peel my applesauce apples (although I don't toss the cores in). I slice + chunk and at the end, I use my stick blender. More nutritious that way too--because the skins are included! Making a fresh batch is super easy and I do it often for dinner. I'm going to check out that book! But I'm pretty sure that sometime before I do, I'll use your line with my own kids. Garbage day is Sunday. I feel it coming.